Andhra Pradesh has one of the best State Curriculums in the country which is developed as per the NCF 2005 guidelines. School Education Department is also implementing several innovative practices and using technology in improving classroom transaction processes. On the other side the dept. has also set up an assessment cell in SCERT in partnership with CSSL to have a focused study on long term objectives. The assessment cell reviews the performance of the students and also schools and evaluates the teaching learning processes on several parameters. The reports of cell are very much useful in observing the status of learning in schools and to identify the learning gaps among the subjects. plans to take up a long term remedial program in two streams for the low performing students as mentioned below. The department of school education has identified class 6th and 10th entering students for its pilot initiative of a summer residential remedial program. Both these classes are crucial due to different pattern of learning and teaching that the student is unfamiliar with. For the summer residential program to be conducted in 2018-19, the department has identified low performing and at risk (of drop out) students through the Summative Assessment-1 ( AY 2017-18 ) in the current classes of 5th and 9th, going to classes 6th and 10th in the next Academic Year. Though the focus of the remedial program would be to bring the students to grade level competency and make them academically ready for the next grade, attention would also be paid to their holistic development through the conduct of extracurricular activities like dance & music classes, theater workshops, robotics and computational thinking classes, etc. School Education Dept. also wishes to extend the summer remediation support to other classes in the years to come in a phased manner. 1. To address the major learning gaps among the V graders during the transition period i.e before they enter high school. due to low performance in class IX. There will be a grand test also at the end to know the impact of the programme and to know how many students will go in to Gnanadhara 2. 1. Remediation in summer for a limited period of 30 days without a structured follow up course will not yield the expected results. 2. Topic-wise remediation might also be required for students who do not undergo the summer residential programme. 4. Only a few teachers take part in summer camp. The rest do not know how to address the learning gaps of many students identified through surveys. However all teachers will get a professional practice in this area through the Year-long Remedial Programme, and get sensitized to apply professional methods to remediate such students they come across in future. The remedial content integrated with class specific syllabus for term 1 and term 2 will be practiced during the specific remedial period allotted in the school timetable for each class. Week end tests (periodical tests), on time completion of the targeted activities in Remedial Class should will be tracked and on boarding of students progress will be continued till end of term 1 and term 2. 1. Print and supply material to all training centers as per timelines. 2. SCERT with the help of IT will map Gnanadhara 1 students and teachers, district monitoring teams, welfare dept. and assign specific duties and responsibilities to each key person. 1. It is of paramount importance that the parents, community and SMC members be given proper awareness on the SRP,to mobilize the students to the SRP campuses. For the same, a detailed campaign, in association with the Department of Social Welfare, will be launched by the H’ble Minister for Social Welfare. 2. The School Heads can organize meetings with the parents and SMC members in the 2nd week of March and explain the importance of the programme, its details and how it impacts their education in the coming year. 3. Posters of SRPs should be used for wide publicity in the schools. Awareness through print/electronic media should also be done at state level. 4. Parents should be given assurance of the security, quality of food and other logistics. 5. Parents should be invited to the campus to see the programme. 6. Parents can visit the campus at any time. However, they can talk to their wards only in the evening hours between 4 to 6 pm. 3. H.Ms will be given the allotment details so that they can arrange meetings with the parents of D1, D2 students and orient them on the details of the programme like purpose, timeschedule, activities, security measures, communication mode, benefits to the students etc. 4. Students will have to report on 30th April 2018 in the allotted SRP camp and complete the registration process. 5. Students should come with all necessary materials like dresses, bedsheets, water bottle/glass, lunch plate, soap box etc. 6. Students will be given Remedial kits after registration. 30.04.18 and take part in the registration of the students, hostel allotment, material distribution etc. 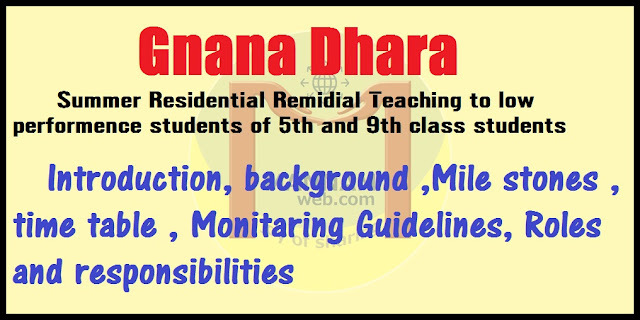 The monitoring team members should visit the Gnanadhara (Remedial training campus) everyday and stay there for the whole day. They have to monitor the programme as per the guidelines given and ensure the effective delivery of the instruction. They also should visit hostels and see the arrangements and try to resolve any quality or other issues. If the matter is serious they should bring it to the notice of the higher officials and help for the smooth conduct of the trainings. Separate guidelines will be issued to the monitoring teams in detail. 1. Biometric attendance machines- teachers would have to log on to the machine before the commencement of and after the conclusion of the subject period. 2. Monitoring and observation sheets- each monitoring squad will be expected to fill in and maintain observation sheets after each visit to the SRP hostel for ease of monitoring by higher hierarchies. 1. Digital Classrooms- will be installed in hostels to aid classroom teaching with interactive digital content. 2. Tablet PCs may also be provided to groups of students for adaptive learning techniques. 1. Week end assessments will be conducted by the teachers. Evaluation will be done by the teachers in the school premises and the results will be conveyed by Monday evening. 3. MEOs can take up the pooling process. Selected list should be conveyed to the Dy.Eos. 6. Teacher should give a self declaration that they are willing to work in this programme as per the guidelines of the Dept of School Education. 2. Women CRPs must be appointed in Girls’ venues. 5. They have to make their own arrangements for their stay in the hostel at night. Class 10: There are 5 remedial classes every day. Mathematics will get 48 hrs Maths, 24 hrs English, Physical Science and Biological Science each. Hence there will be 2 Maths sessions every day and one session for each of the other subjects on an average. The time table will be prepared locally depending on the number of students and teachers allotted to the campus. 24 hrs Telugu, English and Science each. All the students who attended the Gnanadhara Residential campus will be given a participation certificate and course completion certification subject to the eligibility in the grand test. Those students who got 75% and above in the grand test will be excluded from the YRP and the rest of the students will be continued in the Gnanadhara 2 at school level.